In this Sept. 13, 2018, file photo, electronic cigarettes and pods by Juul, the nation's largest maker of vaping products, are offered for sale at the Smoke Depot in Chicago, Illinois. The Food and Drug Administration (FDA) has ordered e-cigarette product makers to devise a plan to keep their devices away from minors, declaring use by teens has reached an "epidemic proportion". Juul said it will stop selling most of its flavored nicotine pods for its e-cigarettes in retail stores — though only temporarily. The company plans to resume sales to retailers that adopt the company's new age restrictions and verification system. The new policy doesn't go as far as expected. Juul said it will stop selling most of its flavored nicotine pods for its e-cigarettes in retail stores — though only temporarily — as it tries to appease federal regulators who have ordered the company to help reduce "epidemic" levels of teen use. The company on Tuesday stopped accepting retail orders for its mango, fruit, creme and cucumber pods to the more than 90,000 convenience stores and other retail shops, CEO Kevin Burns said in a blog post on the company's website. Consumers will still be able to buy all of Juul's flavors on its website and its four tobacco and menthol-flavored pods in retail stores, Burns said. The company plans to resume sales to retailers that adopt the company's new age restrictions and verification system. Juul is banning sales to anyone under 21, even in states where the legal age is lower. The new policy doesn't go as far as expected. A person briefed on the company's plan told CNBC last week that Juul would stop all retail sales of flavored pods. There was no mention of resuming sales at any point. It's unclear when sales could resume. Burns also said the company won't sell flavored pods to retailers that aren't legally allowed to sell them to the public, leaving the door open if federal regulators follow through on plans to restrict those sales to vape shops. The Food and Drug Administration this week plans to restrict sales of cartridge-based flavored e-cigarettes to places like vape and tobacco shops, senior administration officials have told CNBC. 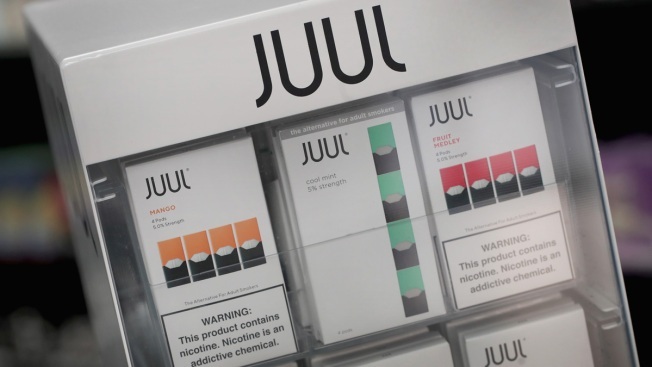 Retailers that want to sell the flavors will need to comply with Juul's new distribution system and age restrictions. Clerks must electronically scan IDs and verify consumers are older than 21, regardless of local laws. The sale quantity will also be limited to prevent bulk purchases. Juul is already dominating the e-cigarette industry, just three years since its popular nicotine pods hit the market. The company, valued at $16 billion, captured 75 percent of the market in the period ended Nov. 3, according to Nielsen data compiled by Wells Fargo analyst Bonnie Herzog. But the e-cigarette's appeal among teenagers has undermined Juul's success and threatened its future. After months of parents and lawmakers begging the Food and Drug Administration to do something, Commissioner Dr. Scott Gottlieb in September ordered Juul and four other e-cigarette makers to fix what he labeled "epidemic" levels of teens using e-cigarettes. He said preliminary federal data show a more than 75 percent surge in high school students regularly using e-cigarettes. That means roughly 3 million, or about 20 percent of high school kids, are using e-cigarettes, up from 1.73 million, or 11.7 percent in last year's National Youth Tobacco Survey. The complete data set is expected to be published this month. "We're in alignment with [Gottlieb] that we need to take action and we need to get this category in a better position," Juul CEO Kevin Burns told CNBC in an October interview. The company declined to make Burns available for an interview Tuesday. This week, the FDA will release its own proposal, which includes to restrict sales of cartridge-based flavored e-cigarettes to places like vape and tobacco shops that tend to enforce age restrictions better, senior FDA officials told CNBC last week. The agency also plans to ban online sales until manufacturers implement FDA-mandated guidelines for age verification, the FDA officials, who asked not to be named because the proposal is not yet public, said. Some other e-cigarette makers have publicly shared their plans to the FDA. Altria said it will voluntarily remove its MarkTen pod-based products and will stop selling all flavors except for menthol or tobacco in its "cig-a-like" products until the FDA reviews and approves them. The company said it also supports federal legislation to make 21 the minimum age to buy tobacco products. Fontem Ventures, a unit of tobacco company Imperial Brands and maker of blu e-cigarettes, said it will raise the minimum age requirements to buy pods on its website to 21 across the U.S. and review its packaging and product descriptions. How Juul made vaping cool and became a $15 billion e-cigarette giant from CNBC.